Hana Horákova (Hana Machová)from the Czech Republic has picked up the 2010 FIBA Europe player of the year award. She came second in the public vote while having the highest number of votes from the expert panel. Sandrine Gruda from France and Amaya Valdemoro came second and third respectively. Horákova's international basketball career started as a youth international in 1995. She represented her country during the FIBA World Championship for Junior Women in 1997. By 1998 she was already a senior international and participated in EuroBasket 1999. She won a silver medal at EuroBasket 2003 and Gold in 2005. Horákova was a member of the team that finished fifth in 2007. In 2009 she took a break from the national team and did not play at EuroBasket 2009. Horákova is a two-time Olympian (2004, 2008) and has also played twice in the World Championship (2006, 2010). During the 2006 World Championship she led the tournament in steals while in 2010 she won the Most Valuable Player Award (MVP). At club level, she won the Czech Championship title for nine seasons in a row (2000-2008) with Brno and the EuroLeague Women title in 2006. She has also been voted Czech Republic player of the year twice (2003, 2004) and she also picked up the 2010 Gazzetta dello Sport European player of the year (POY). Horákova is playing outside of her home country for the fist time in her career this season with Fenerbahçe S.K. in Turkey. A weighting formula to determine the final ranking. The table below shows how the experts and public voted. 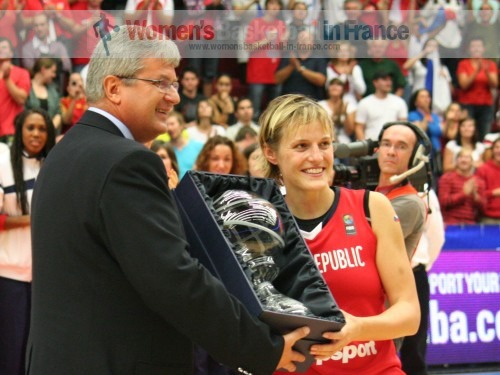 womensbasketball-in-france.com has been included in FIBA Europe expert panel. The table below shows how the experts and public voted.